The Greens NSW spokesperson on mining Jeremy Buckingham has warned the O’Farrell Government that it is badly misreading community sentiment on the conflict between mining and agriculture in what appears to be senior pro-mining Liberals riding roughshod over the National Party and the interests of country NSW. “Minister Hartcher is badly out of touch if he thinks community concern over mining’s impact on agriculture, the environment and water resources is some kind of conspiracy,” said Greens MP Jeremy Buckingham. “This kind of arrogant disregard for genuine community concern is the kind of thing we expected from NSW Labor in its dying days, but this exercise in hubris is only one year into the O’Farrell Government. “It’s clear that senior pro-mining Liberals in the O’Farrell Government are running roughshod over whatever Nationals are left who truly wish to protect our land and water. The dissenting submission from the National Party to the Strategic Regional Land Use Policy consultation shows there are still some Nationals who want to protect the interests of country NSW, even if many National MPs are lining up with the big city Liberals to promote mining. “There is a confluence of interest in protecting the land and water from mining. Farmers recognise the need to preserve these precious resources into the future, while environmentalists understand that farmers are important custodians of the land and water,” said Mr Buckingham. As a rural land owner & miners daughter & someone who had great hopes for change in nsw gov approach to industry running roughshot. I find minister hartchers comments offensive. If the coalition did as they promised instead of stalling then turning their back on farmers & the environment, there would be absolutely no reason to protest! 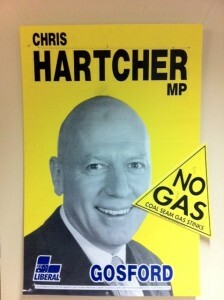 Arrogant politicians run a close second behind coal seam gas mining. We do not need/want either of them.